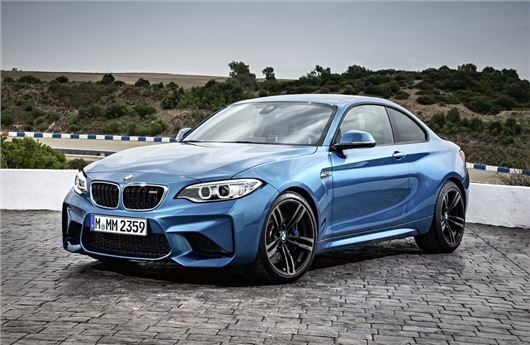 BMW has unveiled the high performance M2 which effectively replaces the 1 Series M Coupe in its line-up. Powered by a 3.0-litre engine with 370PS, it will go on sale in spring 2016 priced at £44,070. The straight-six engine has been specifically developed for the M2 and when fitted with the seven-speed M DCT gearbox, delivers a 0-62mph time of 4.3 seconds (4.5 seconds for the manual) and a limited top speed of 155mph. It will rev to 7000rpm with maximum torque of 500Nm thanks to an overboost system. Taking the standard 2 Series, BMW has reduced wind drag with the use of air intakes in the front bumper. It also gets wider wheelarches to accommodate the wider track and wheels. At the back there's a subtle M spoiler on the boot and an integrated diffuser with dual twin exhausts. The stiffer body sits on 19-inch alloys with Michelin Pilot Super Sport tyres developed specifically for the M2. As you'd expect given the high performance nature, it has uprated brakes with blue metallic painted callipers. There is also an Active M Differential designed to maximise traction. A six-speed manual gearbox comes as standard while there's an M DCT as an option. The latter includes the delightfully named 'Smokey Burnout' function, which lets you indulge in a bit of wheelspin at low speed. Claimed fuel economy is 33.2mpg for the manual and 35.8mpg for the M DCT. The interior of the M2 has black Dakota leather seats with a contrasting blue stitch plus adjustable side bolsters for both front seats.